The English Wedding Ring quilt block is based on a 5 by 5 grid, so the math is easy. This block can be sewn as a five patch or in the manner I have chosen to construct it -- as an uneven nine patch. Neither method is correct -- just a preference. 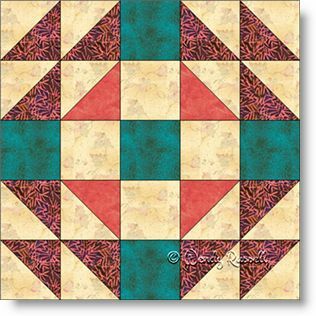 This quilt block contains only two different quilt patches -- the square and the half square triangle. These two patches are the most commonly used units in quilting. The sample quilts illustrated show two entirely different looks, just by setting the blocks either as a straight setting or on point. Different fabric choices for all the finishing touches also contribute to the very different end results.